When people talk about freshwater ecosystems, the first images that come to mind are animals like fish, frogs, turtles, and birds. These organisms, called vertebrates, are the largest and most familiar life forms found in freshwater environments. However, a much more abundant and equally important part of the health of these ecosystems is a group of animals called invertebrates. These creatures are vital to both the long- and short-term wellbeing of aquatic ecosystems because of their sensitivity to environmental factors and their basic position in the food web – any disturbances in their populations result in a domino effect that negatively impacts animals higher on the food chain. Thus, a healthy invertebrate population equals a healthy ecosystem. BioHaven® Floating Islands are an efficient, natural method of keeping invertebrate organisms, and therefore, the entire state of the body of water in which they are implemented, healthy. Invertebrates, in contrast to vertebrates, are simply animals that lack an internal skeleton. Many aquatic invertebrates live on, under, and around sediment on the bottoms of bodies of water such as lakes, rivers, streams, and ponds. 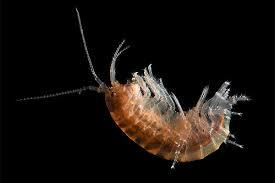 Invertebrates are often regarded as “benthos”, which refers collectively to organisms that live on the bottom. These benthic invertebrates include the larval stages many different species of beetles, mayflies, caddisflies, stoneflies, dragonflies, aquatic worms, snails, leeches and numerous other organisms that inhabit the bottom. Invertebrates are essential to the health of aquatic ecosystems. Their sensitivity to changes in environmental quality makes them excellent biomonitors, and data gathered from benthos populations can be used individually or in combination with other environmental characteristics to measure the level of environmental harm caused by contaminants. Since different species exhibit different responses to changes in these factors such as water chemistry, pH level, and pollutant concentration, the wellbeing of benthic invertebrate communities can “paint a picture” of the quality of the aquatic ecosystem as a whole. As a result of the fact that invertebrates make up one of the first few steps of the aquatic food web, the health of benthic organisms not only reflects the health of the ecosystem but also directly influences it. Unhealthy invertebrate populations can constitute disturbances, such as when they transmit diseases. For example, certain benthic invertebrate species serve as parasite-transmitters; if these invertebrates increase their populations in stream sediments, they may spread a lethal disease to fish, causing their populations to decline as well. Drops in the levels of benthic species responsible for decomposing dead organisms can result in accumulation of organic nutrients to dangerous concentrations, which can cause formation of toxic algal blooms, loss of oxygen in deeper waters, and high amounts of harmful pollutants such as ammonia and hydrogen sulfide. In short, keeping aquatic ecosystems healthy means making sure that its invertebrates are healthy. Floating islands are efficient, natural regulators of environmental factors that determine the health of benthic invertebrates. By using biofilms living within their matrix material in combination with the phytoremediation abilities of plants, Biohaven Floating Islands are able to reduce excess nutrients, stable water pH levels, and eliminate contaminants, all of which positively impact benthos populations. Our rivers flowing through industrial areas typically no longer have the overhanging banks so valuable for a healthy eco-system. Marek Landscaping installed floating islands for habitat restoration in the Milwaukee River. Dylan Olson, fisheries biologist, cut out a core sample after one year to understand the population living in the islands. He found a healthy population of important benthic invertebrates, including insect larvae, snails, and crustaceans from the families Amphipoda which are responsible for recycling nutrients. The specimens found were Gammarus, Chydorus Sphaericus, Chironomid Larve, and Polychaete Worms (Try saying all that 5 times fast). Invertebrates from the Copepoda family were also found, the main invertebrates were Cyclopoida and Harpacticoida, which are very good bio-indicators. By ensuring the health of these vital organisms living at the bottom of freshwater lakes, streams, rivers, and ponds, floating islands promote the health of the ecosystem as a whole. The largest lake in California is called the dying Salton Sea. Special interest want the Salton Sea to be greatly reduced so 1.8 GW of geothermal energy and geothermal brine mining can be extracted. Ecomedia Compass, Agess Inc, Joi Scientific, Sephton Water Technologies, Gary Jennings, Dr Carl Hodges are all working together to restore the Salton Sea. Their goal is to gravity feed the Laguna Salada and the Salton Sea with ocean water from the Sea of Cortez. Now that Joi Scientific sent a letter of support to Agess Inc (posted on Agess Inc Facebook Page) this transformational company can generate surplus ultra low cost energy from ocean water as well as desalinate it on demand. Any type of toxic, polluted, brackish, sewage, fresh and ocean water can be used as a self sustaining energy source. By combusting or using the hydrogen on demand generation pure distilled water is generated. This technology working with Agess Inc and Associates will be able to replace the outdated geothermal energy and desalinate the ocean water to reduce the toxic salinity levels of the Salton Sea. The waste brine can be converted into building materials that Eric G of The Salt Project: Building with Sea Water has invented. 100% of the waste brine can be converted into highly profitable industrial chemicals that Salt of The Earth Energy LLC located in Texas has invented. Joe Veytia is the CEO of SEE. Waste brine is also perfect for solar gradient ponds to generate surplus energy. 80,000 new home can easily be built around a healthy Salton Sea. Using waste salt for building products would be ideal. Dr. Carl Hodges teaches how to use ocean water to grow fish, shrimp and use the waste materials of the vast fish & shrimp farms to fertilize salicornia, mangroves and other salt tolerant plants called halophytes. With the Salton Sea and the Laguna Salada hopefully restored with life sustaining ocean water and desalinated as well the Mid West Floating Island hopefully can contribute to the cogent force of Agess Inc and Associates. Please contact Nathan White of Agess Inc. and let him know about your important contributions to the worlds ecosystems. As a response for Leroy Essek and his valuable contribution: Leroy, Floating Islands West (West Coast) has been working on avenues to contribute to the health and remediation efforts for the Salton Sea for over 10 years. As you may expect the process has been challenging at best. We (FIW) are a sister company to Mid West Floating Islands while under the same leadership of Floating Islands International. Agess Inc. has and is providing a centralized effort, while combining with several technologies to work in concert with each other, for the benefit of Salton Sea. Floating Islands West and its vast network of remediation strategies felt the movement of Agess Inc. to be valid and valuable for moving forward and has teamed up. We can and will make a difference.